This stoneware stein pays tribute to the profession of cobbling. 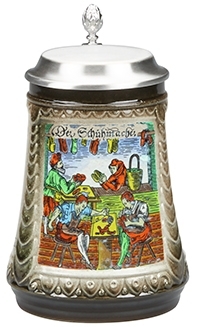 The front panel of the stein features a beautiful, full-color illustration of a cobbler working, and "Cobbler" written in German. The right side panel features a one-color coat of arms. The left side panel features more German text.